4.0 颗星，最多 5 颗星it's all good! No Algood peanut butter isn't the best peanut butter on the market (even though 75% of it all tastes the same anyway) but compared to the horrendous Hampton Farms peanut butter I had last month, this stuff is like taste bud heaven in comparison. I actually had to suffer swallowing two jars of Hampton Farms peanut butter all because I didn't want to feel guilty for throwing away food that my father bought. My guilty conscience got the better of me again! 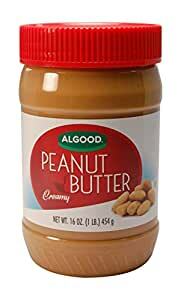 Anyway I haven't had the chunky Algood peanut butter which is preferable to my tastes, so I imagine that one's even better than the smooth variety. This peanut butter has a slight healthy-tinged taste to it like it's intended for those who seek a healthy diet, however it's *still* leaps and bounds better than Hampton Farms peanut butter. Yes, Hampton Farms peanut butter- that's the yuckiest stuff ever, haha.